My dear friend Betsy made an amazing recipe (for her, at least) for salmon that uses a parchment packet and fresh citrus fruit. 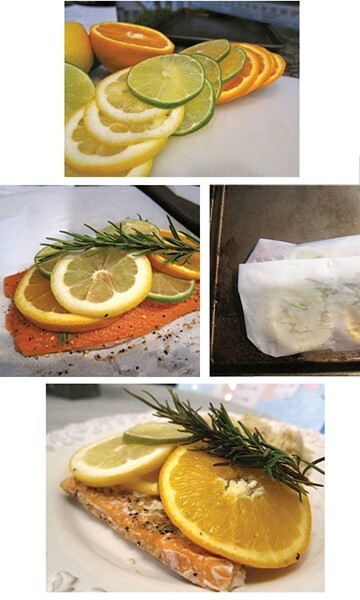 The way she described it sounded so good, I demanded the recipe for this so-called Citrus Salmon in Parchment. Unfortunately, the recipe didn't turn out so well for me when I tried it. I think I must have royally messed this one up somehow because my fish turned out pretty bland and overcooked. Here are my step-by-step photos. Why don't you give it a whirl and let me know if it works for you... Find the recipe at AllRecipes.com here.